We offer house calls in the local area! We can come to you for annual physical exams, vaccines, blood collection, fine needle biopsies, hospice care, and euthanasia. Your pet’s oral health is important to their overall heath and well-being. Curing and preventing dental disease is what we do best at Port Hope Veterinary Hospital! We are a full service hospital offering a wide range of surgical services. In addition to spays and neuters, we offer surgical services for many surgically correctable diseases. We’ll help your pet look and feel their best with our amazing grooming services. We offer nail trimming, ear cleaning, bathing, and beautiful haircuts. Dogs and cats are equally welcome! Get to know the doctors and staff at our hospital! We have a dedicated team of professionals who take the care of your furry family member seriously. Our mission is to provide compassionate care and excellent customer service. We believe pets are family. 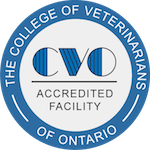 If you live in Port Hope, Ontario or the surrounding area, then you have picked the perfect site to find a veterinarian. We want your pet to live a long and happy life. Our veterinarians treat all types of pets and animals. Your pet’s health and well being is very important to us . We want to offer your pet the best possible care. Call us right away: (905) 885-4525. Emegency After Hours Calls are directed to Kawartha Veterinary Emergency Clinic: (705) 741-5832. If you live west of Port Hope, please call Animal Emergency Clinic of Durham: (905) 576-3031. © 2019 Port Hope Veterinary Hospital | Port Hope, ON.